Here are some of the best inspirational christmas stories, poems, and quotes ever written and some stories that are not as well known . Christmas is one of my families favorite time of the year. Our families gather together to trim the tree and decorate a gingerbread house at grandma's house. We have our traditional cup of hot chocolate with marshmallows on top and we watch old holiday shows and movies. One of my favorite christmas movies is Charles Dickens, A Christmas Carol, also known as scrooge. It is one of the all time great inspirational Christmas stories. The moral lesson of A Christmas Carol is phenomenal. Another one of my favorite short inspirational christmas stories is Amahl and the Night Visitors. I absolutely love that story. I remember my sisters and I watching it every Christmas. I also bought a cassette tape with the story Amahl and the Night Visitors for my children and they listened to it every year. Now I am excited to tell and share my favorite christmas stories, Christmas songs, and Christmas movies with my grandchildren, Mikayla who is now 6 years old, and Mykah who is 1 year old. I look forward to this time to share with my family and friends every year. Enjoy some of these timeless Inspirational Christmas stories with your family. Ebenezer Scrooge hunched over his account books. Scrooge's clerk, Bob Crachit, huddled at his own desk in the tiny outer office. The front door burst open, and a blast of December air whipped through the two rooms. "Merry Christmas, Uncle!" said Scrooge's nephew, as he strode into the office. "Christmas," muttered Scrooge. "Bah! Humbug!" "You can't mean that, Uncle," said his nephew. "Why don't you close early today?" "And become like other Christmas fools, buying gifts I can't afford?" Scrooge turned back to his books. "No, thank you." "Suit yourself," said his nephew. "But I hope you'll at least stop by for Christmas dinner tomorrow." When his nephew opened the door to leave, another gust of wind burst into the office. With it came the sound of carolers singing. Scrooge banged his window open. "You!" he shouted at the carolers. "You there!" One of the carolers, a young boy, stopped singing and stared up at Scrooge. "How can a person do an honest day's work with you howling outside his office?" Scrooge snarled. "Find another street corner for your noise. Leave me in peace!" Scrooge banged the window shut. "Merry Christmas, indeed," he muttered. "What do they have to be merry about?" "Sir?" Bob Crachit tapped on Scrooge's door. "I've copied all the letters and filed the paperwork. I also brought in more firewood and swept out the ashes. And, well, it's closing time, Mr. Scrooge." "Fine," said Scrooge. "If your work is finished, you may leave." "Mr. Scrooge?" said Cratchit. "Tomorrow is Christmas, a day to spend with family." "You'd like the day off, I suppose?" Scrooge said, as he glared at him. "Well, yes, Mr. Scrooge," said Cratchit. "After all, it IS Christmas." "Christmas? Bah!" Scrooge shook his head. "Fine. Take tomorrow off, but be here early the next day." "Yes, sir. You can count on it, sir," Crachit said, as he pulled his coat snug around him. "Merry Christmas, Mr. Scrooge." "Humbug," growled Scrooge. He opened the front door, and Crachit scurried out. At the corner, neighborhood boys were sledding down a steep hill. Crachit leaped headlong onto one of the sleds and slid to the bottom of the hill, laughing and shouting, "Merry Christmas!" "Fool," Scrooge scowled. He settled back into his chair and finished tallying his accounts. Darkness fell, and Scrooge closed the last account book. He stood and stretched, his back stiff from the cold and the long hours hunched over his work. As he locked the countinghouse, he glanced at the sign above the door. It read: THE FIRM OF SCROOGE AND MARLEY. 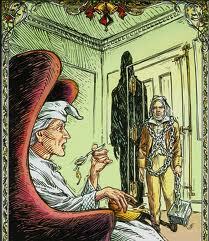 "Jacob Marley," said Scrooge. "A man who knew the value of a day's work. Too bad he's gone." 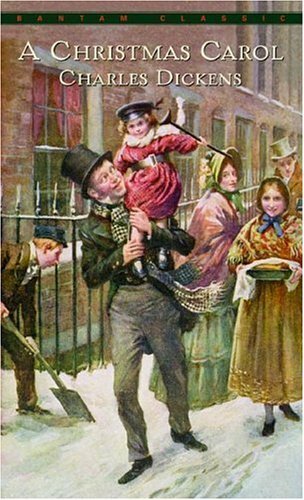 Scrooge trudged home, climbed the steps to his bedroom, and huddled in a chair beside the fire to eat his evening gruel. CLANK! "What the devil?" Scrooge sat still and listened. He heard nothing. "I must have been dreaming." He settled back into his chair. CLANK! CLANK! Scrooge sat up straight. "That was no dream," he muttered. "No, it wasn't a dream, Ebenezer." A voice echoed through Scrooge's bedroom. A man, pale and ghostly, drifted into the room. Scrooge stared at him. "Marley? Jacob Marley? But you're--you're--"
"Dead." The ghost nodded. "And paying for my sins." "Sins?" Scrooge frowned. "But you were a good man, Jacob. A fine businessman." "Business? Hah!" Marley's ghost shivered. "Business is meaningless. I never learned the value of love and charity while I was alive. Now I wander the earth, unable to find peace. The same fate awaits you, Ebenezer, unless you change your ways. Three spirits will visit. The first will arrive when the clock strikes one." The ghost tipped his hat and vanished. Scrooge pulled the covers over his head. BONG! The clock struck one. "Ebenezer? Ebenezer Scrooge?" Scrooge peeked out from beneath his sheets. A woman, pale and shimmering, stood beside his bed. In her hand she held a sprig of holly. "Who are you?" whispered Scrooge. "I am the Ghost of Christmas Past," said the ghost, as she motioned to the door. Scrooge crept from his bed and followed the ghost. The room began to dissolve, and soon he was staring into the window of another room, small and dark. "This house," said Scrooge. "It seems familiar. Why, it's the house I grew up in." "Yes." The ghost nodded. "And the boy? Is he familiar, too?" Scrooge peered through the window. A small boy sat alone in the corner, reading a book. Scrooge's eyes grew wide. "It's me as a child! But why am I -- why is he -- sitting by himself?" Scrooge stared at the boy. "It's Christmas day, isn't it?" The ghost nodded, then asked, "And where are your parents?" Scrooge frowned. "Working, I suppose. They worked hard when I was young to give me the things I needed." Scrooge studied the boy. He looked well-fed and well-dressed, but his eyes were sad and scared. He reminded Scrooge of the caroler from the night before. Then he remembered how he had yelled and frightened the boy.